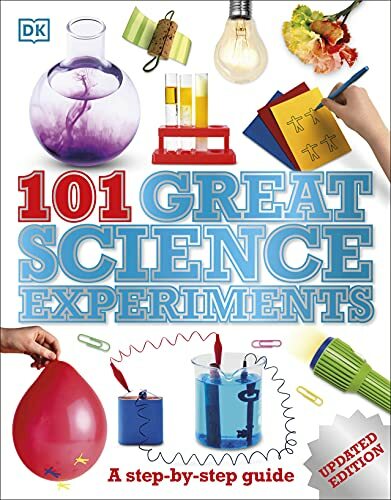 Lets you make science fun with 101 step-by-step science experiments for kids that are safe and easy to do at home. This book helps you find out how to use everyday objects to discover the principles of science. With easy, step-by-step science activities for kids using ingredients found at home, discover the secrets of chemistry, physics, and biology, and much more. Be the next Albert Einstein with these cool science experiments. Discover how to bend light, construct a circuit, see sound, build a buzzer, make a rainbow, and even make an underwater volcano! Each science project is explained simply and clearly, with specially commissioned full-colour photography that shows how each project should look, making the experiments even easier to follow. The chapters are arranged thematically and include - Air and Gases, Water and Liquids, Hot and Cold, Light, Colour, Growth, Senses, Sound and Music, Magnets, Electricity, and Motion and Machines. Great Science Experiments is a children's science book that packs fun into experiments while explaining core scientific principles. A child can perform most of the experiments alone, but friends and family can join in and learn about science, too.